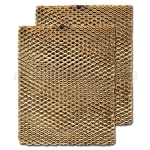 Honeycomb filtration traps mineral pollutants found in water and helps prevent them from entering your home. Replace filter once every 6 months for optimum performance. Areas with hard water may need to change their humidifier filter more often. Size: 10 3/4" x 8 7/8" x 1 7/8"
Click here for instructions on changing out your water panel.